KUALA LUMPUR: Upstream activities are increasing in tandem with crude oil prices that are climbing steadily. While things are looking up in the oil and gas (O&G) industry, many domestic O&G companies are still bogged down by high borrowings and finance costs. 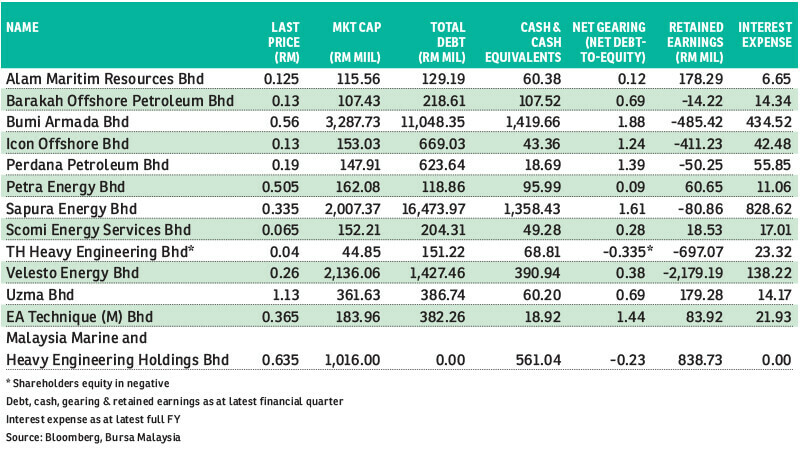 Given the growing optimism in the O&G industry, some quarters believe more debt-laden companies are likely to tap on existing shareholders’ for fresh capital by making cash calls. “Some players can [undertake rights issue], but not all. But I do expect more high-gearing companies to make cash calls,” said Areca Capital Sdn Bhd chief executive officer Danny Wong Teck Meng. Debt restructuring would be essential to give these companies the breathing space so that the high finance cost would not be straining their finances. Nonetheless, they also need fresh capital to execute jobs as new orders start flowing in. Furthermore, it is hard to obtain jobs when finances are weak. With improved sentiment, cash calls would be the more appropriate channel to raise working capital, although rights issue seldom goes down with shareholders as reflected by the sharp fall in share prices of the companies that have announced rights issue. Wong concurred with the view that after Sapura Energy Bhd, the next in line with “concerns over debt” to finance in the near term could be Bumi Armada Bhd. “I think [for Bumi Armada] the best option is capital injection,” Wong told The Edge Financial Daily. The company has US$500 million worth of bank borrowings due in stages in October and December, and in May 2019. It said back in March that it is assessing options to raise funds including “potential share placement, asset divestment, establishing equity partnerships and obtaining debt funding”. “But for projects with tighter time frames, companies may still turn to debt financing,” he said. HLIB Research analyst Sean Lim opined that debt restructuring through the Corporate Debt Restructuring Committee (CRDC) is another option for some companies. He pointed to loss-making Alam Maritim Resources Bhd, which has just signed supplementary agreements with its financiers on Sept 6 to restructure its existing debt under supervision by the CRDC. As at June 30, Alam Maritim had long- and short-term borrowings of RM15.27 million and RM113.93 million respectively. While the figure affected was not disclosed, terms under the debt-restructuring exercise include a repayment period of up to seven years and maximum interest rate of 5%. “That is one way to reduce financing costs,” said Lim. “And we have seen in the case of Velesto Bhd and Sapura Energy … their share prices reacted quite sharply when their cash calls were announced,” he said. If Bumi Armada, too, seeks more support from the banks such as CDRC, its success will hinge on the ability to ensure the Armada Kraken floating production storage and offloading vessel achieves final acceptance, said Lim. “Everything boils down to Kraken. If they cannot get Kraken [for final acceptance], even banks won’t refinance [its debt],” he added. Last Friday, Bumi Armada announced to Bursa Malaysia that Armada Kraken had been issued with the final acceptance certificate. “The final acceptance was completed in accordance with the requirements set out in the bareboat charter contract dated Dec 20, 2013 (as supplemented by Amendment Agreement Number One, dated Aug 19, 2016, and Amendment Agreement Number Two, dated Aug 27, 2018),” said the announcement. Sapura Energy’s share price dropped to the all-time low of 33.5 sen from 60 sen after the cash call was announced. Shares of Velesto (formerly UMW Oil & Gas Corp Bhd) also took a beating when it undertook a cash call to raise RM1.8 billion in January 2017. It slipped below its right issue price of 30 sen apiece from above 80 sen. Since the completion of the rights issue in September last year, Velesto’s interest costs have declined 45.6% to RM19.76 million in the second quarter ended June 30, 2018 (2QFY18) from RM36.32 million a year ago. Total debts shrunk to RM1.43 billion from RM3.42 billion previously. Gearing ratio more than halved to 0.38 times from 1.37 times in the same period, while current ratio rose to 4.01 from 0.28 times. In the case of Velesto and Sapura Energy, both benefited from strong shareholders like Permodalan Nasional Bhd which is willing to put yet another round of investment into the business. 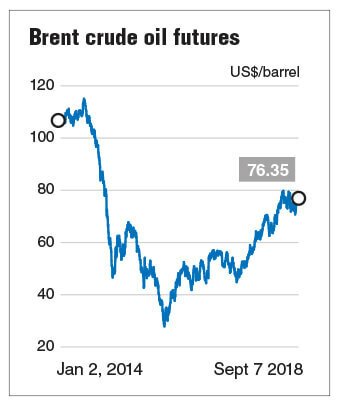 But it might be different scenario for those O&G companies that do not have shareholders with deep pockets and are willing to pump in fresh capital. Another company that is currently dealing with CDRC is Perdana Petroleum Bhd. Reports show that CDRC only accept cases when a company is able to generate positive cash flow post-restructuring. All said, some segments, for instance offshore support vessel (OSV), are still in choppy waters as the freight rates are not recovering as fast as the crude oil prices. Some OSV operators told The Edge Malaysia weekly that margin squeeze is still common. Many of them are not earning enough to even cover the operating costs simply because vessels are currently chartered out at the rate below operating costs, which have gone up partly due to the weak ringgit. Such a situation would make it harder for OSV operators to get out of the woods, should the oil majors keep pressing down the freight rates.